Mobile devices are now pervasive across enterprises worldwide. Businesses are struggling to deal with enterprise mobility issues such as company issued or BYOD smartphones and tablets opening up unprecedented mobile access to corporate data and resources. For over ten years, Amtel has helped customers large and small around the globe take control of mobile device security and communications expenses. Amtel are an MDM vendor who can help you manage mobile device security, simplify mobile apps management, reduce communications costs, and increase operating efficiency with a single integrated solution. Cloud based Amtel solutions are compliant with SSAE 16 Type II security, with the highest level of data security and reliability as compared to other MDM and TEM vendors. And our 95% customer retention rate is testimony to our industry-leading “Human Support” delivered by our customer service team. Amtel love our customers and we’re proud to say they love us back! When you manage mobile phones and tablets with Amtel’s mobile device management (MDM) solutions, you get security, control, and efficiency. Rapidly roll out mobile devices in your organization safely while lowering costs. Amtel’s Mobile App Management for smart phones and tablets help enterprise customers take control over mobile apps with the ability to easily setup and manage both public and private apps in their organizations. Mobile security policies help protect sensitive information, minimize risks, and meet regulatory compliance requirements. Enforce workspace restrictions on both corporate owned and BYOD mobile devices with pre-defined configuration settings for access control, content sharing and mobile app usage. Bring Your Own Device (BYOD) program provides flexibility to corporate users so they can transition seamlessly from personal context to work context and vice versa on their personal devices, resulting in increased productivity for the business and satisfied users. Amtel’s Mobile Device Management solution ensures BYOD security and policy compliance while simplifying enrollment and management. 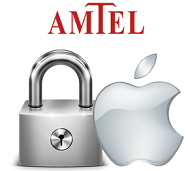 Amtel offers enterprises a complete solutions for Apple iOS device management and Mac OSX MDM deployments. Choose deployment methods that suit the needs of the organization, including over the air Apple Push Notification Service, Remote Management APIs and Apple iOS Configurator enrollment. 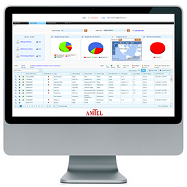 Amtel solution supports Apple iOS versions 4, 5, 6, iOS7 and Mac OS X. Take control over corporate and BYOD Android smartphones and tablets in minutes with Amtel’s Android device management software as a service from a centralized cloud based console. MobileSecurityWorks.com is a division of Virtual Graffiti Inc, an authorized Amtel Partner.